I think it happens in all marriages or long-term relationships: at some point, that zing — that mysterious and powerful tension — that cackled and sparked in the early days of the relationship dissolves into something that’s a lot more tepid. It definitely happened in ours. And let me be clear: I’m not talking about romance or attraction, or even THAT specifically, either. With a little bit of effort, I think all of those things are sustainable. Martin has always been good about finding little romantic things to do for me, and I like to think I‘ve done the same for him. And I’ve never doubted that he finds me attractive, just as I’ve always found him to be one good-looking dude. No complaints here. But after awhile — and especially after three kids and more than a decade together — things become … comfortable, right? Like, it’s just assumed one will get a kiss from the other before leaving the house, if one’s not in too much a rush. What was once bought at Victoria’s Secret gets picked up from the clearance rack at Target. Putting on anything other than yoga pants is a sign you want to be taken out. Nobody thinks twice before passing gas under the sheets. And there are no surprises, except maybe when helping identify whatever it is that’s growing on the other’s back that he/she can’t see in a mirror. It’s not that this level of comfort is a bad thing. In fact, being at that comfort level with each other is a comfort all by itself, in a way, because it means we’ve been through it all, we know each other completely, and are free to be ourselves. Yet, being at that level also means that gone are the days of that zing, that puppy love and anticipation, right? It IS possible to put zing back into one’s marriage even after fourteen years together, three kids, stretch marks and hair loss. Here’s how you can do it, too. 1) Send your spouse or significant other to basic military training, or some other environment that’s going to completely remove them from your home for months at a time. Deployments are an alternative, but I don’t recommend them. Be sure that all forms of communication are severed, except for traditional letter-writing and maybe one phone call every two weeks. It also helps if wherever you send them uses physical fitness as punishment in the form of push-ups, situps, and flutter-kicks. 2) While your spouse is away, write a ton of letters and feel free to share things that are much easier to share on paper than they are person-to-person. 3) Lose nearly 20 pounds, but don’t mention it at all to your spouse. On the days you reunite with your loved one, wear clothes that fit you well and show off your assets. (Hey, that’s advice straight from Tim Gunn!) In fact, wear a snazzy dress in his favorite color on you. Bonus points if it’s two sizes smaller than what you were wearing when he left. Get your nails did and your hair done, too. 4) No matter what, do NOT forget the rules. Most importantly, don’t forget that Airmen in uniform are not allowed to participate in any form of PDA (public display of affection.) This means no kissing, no hugging, no snuggling, no hand holding. Even if the closest you’ve been to holding your spouse’s hand in public in about five years were all the times you were handing a diaper bag/stroller/baby bottle/flashing the bird to him, you will suddenly want to hold his hand all the time. Nope. Don’t do it. You get about 20 seconds to do this when you FIRST see your spouse, but anything after that is unacceptable. 5) Don’t gawk too much when you finally see your spouse and you see that all the running, push-ups, sit-ups, and flutter kicks shaved about 10 years off of him, and that he still looks really, really good in uniform. Try not to stare. 6) Be prepared to feel incredibly awkward at all times. Don’t take it personally when, after the official graduation ceremony and after he’s already seen you the day before, your spouse just sort of pats you on the back because he doesn’t want to break any rules … and he doesn’t want others to think he’s breaking the rules, either. Use your kid — who is allowed to hold hands with your spouse — as a barrier. Be prepared for questions and clumsy behavior. Such as when your daughter asks in the car why Dad won’t hold Mom’s hand, and as he’s explaining the reasons, you turn on the car radio only to realize you left the volume turned up and the song that’s playing on the radio just happens to be “Sexual Healing” by Marvin Gaye. Bonus points if your husband’s wingman from Nigeria is in the back of the car, singing along as you fumble for the volume because he thinks it’s a really good song. Yeah. Awkward. 7) At other times, try sitting or standing far apart from your spouse so that nobody suspects you really just want to jump each other’s bones. Try not to blush when your good friends — ah, those good, ol’ friends — point out that they can tell you just want to jump each other’s bones. Be horrified when they actually capture this in photos. 8) When touring your husband’s dorms while wearing that snazzy dress, be sure to remember that there are chrome strips running along the floor and they’ve been polished to shine. And reflect. Since you are a lady, don’t panic: just swiftly step/shuffle over them so that nothing is revealed. But as you are leaving the dorms, lean over and whisper to your husband that a warning for such an issue would have been nice because one can see everything — everything — in those chrome plates. Pretend not to notice his jaw drop. 9) In the most gracious and vague way possible, ask your husband to (gently) ditch his wingman — who has provided excellent wingman support for two whole days — because you and your daughter had your hearts set on going to SeaWorld for some family time on his first day of town pass. Pick him up early the next morning and mention that your daughter went to the early morning Shamu show with a friend, and that you guys will join them there. But the truth is, you’ve actually arranged it so that your daughter gets to spend her day at the zoo with a friend’s family. But he doesn’t have to know that. Are you following us yet on Facebook? Julie’s on Twitter, too. Come follow and say hello! After the ceremony and all the picture-taking, we said goodbye to our friends and headed over to the dorms for the open-house visit. Walking into the area was such a mind trip because not very much has changed since I went through BMT. Though my squadron (the 331st Training Squadron) was located in a building just down the road, all the dorms look the same. The patios. The stairwells. The hallways and open bays. It was like stepping back in time with my husband and daughter. Martin’s bed was the bottom of the first bunk on the left. Fun fact: his blue shower shoes are the ones the Bundeswehr issued to him. Martin showing us his personal drawer. He received so many letters, he had to line the bottom of the drawer with all the envelopes and cover it with a towel. We told Miss C we expect the same hospital corners on her bunk bed. It was also a very sweet experience to meet the other Airmen who went through basic training with Martin. Not only did Martin write about some of the Airmen in his letters, but I also connected with a lot of their families via the Air Force WingMoms website and forums. During the two months of BMT, we all shared stories, worries, questions, and encouragement as the men of our lives went through that experience. Every now and then, I shared parts of Martin’s letters, too, since he did such a great job describing the various things they were doing, such as going through the gas chamber or making mistakes during drill practice. During our time in the dorms, some of those families from the group approached us and introduced themselves. It was so cool to see Martin caught off-guard by the attention. While I did write to him about the Facebook group, he had no idea the reach and impact. Vicky and her mom Judy were so cute: they told Martin they were so relieved when they learned Vicky’s son was in Martin’s flight. Knowing their son was around “someone like [Martin] really put their minds at ease,” they said. After touring the dorms, Martin was then free to leave the base and spend the rest of the day with us in San Antonio. So we headed out with his wingman, Larry, and made our way to the Riverwalk downtown, where they got to see the Alamo and have a quick lunch at Boudro’s Texas Bistro. We were also pulled into a welcome center, where the two men left pins on a huge map, indicating where they come from. 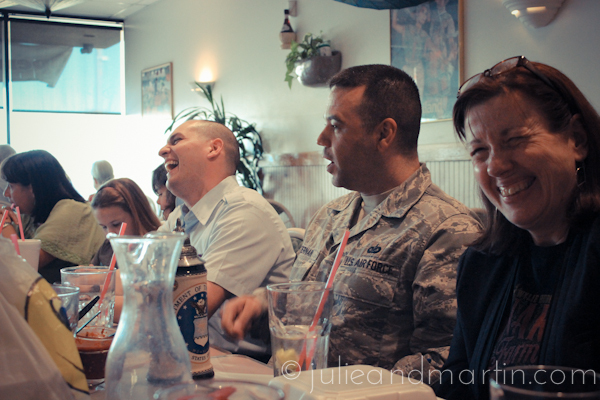 Later in the afternoon, we headed west to a local Asian restaurant near Lackland Air Force base, where we were greeted by more Air Force friends who all gathered to celebrate Martin’s graduation. Annette was there with her boyfriend Mark. Eric — who helped me plan various Air Force workshops, and who also worked for the same company when we both left active duty — and his wife Peggy were there. Todd — who was the deputy public affairs officers at Ramstein when I was there — brought his whole family, including his wife Mari, and his three children. I almost had a heart attack when I saw his oldest son: he was just a baby the last time I saw him and now he’s a charming and articulate young man. Almost a teenager! I couldn’t believe it. Stephan retired after serving as an Air Force photographer, and he’s someone I’d worked with at various public affairs workshops, too, and he was representing his wife Piper, another friend of mine who is serving overseas right now. And of course, Trevor was there. It was the first time I finally got to meet Trevor in person after SIX YEARS. Though he was my replacement on the combat correspondent team when I deployed, we missed each other by about 30 minutes in the terminal as I was heading home on a flight, and he was just arriving. We stayed in touch via email, though, and the occasional phone call, especially since his team experienced a lot of the lunacy my team faced during our months over there. As social media evolved, we connected through there, and when Martin decided to enlist, he was the first person I reached out to for information. It was so good to finally meet him, and I didn’t even mind giving up my seat next to Martin for him. Because you know, two foreigners with foreign military experience who were both military training instructors DEFINITELY had a lot to talk about. I forget what we were talking about, but I was very animated. Todd presented Martin with an official public affairs coin, and I got a few base newspapers for old times sake! I think we stayed at the restaurant for three hours. I didn’t even eat anything, I was so busy talking and catching up with everyone. Even Martin’s wingman, Larry, who didn’t know anyone, seemed to have a great time. By the time Miss C and I dropped Martin and Larry off at the dorms, we were exhausted. Once we got to the hotel, we changed into our swimsuits and headed out to the hotel’s heated pool, only to realize it wasn’t that warm at all. So we dipped into the jacuzzi instead, which we had all to ourselves. And as the two of us floated on the bubbles, swatting away the ginormous Texas flies swooping down over us, I couldn’t help but think that it was a pretty awesome day. Miss C and me, looking for our Airman. Photo by April L.
Martin graduated from Air Force Basic Military Training on Friday, April 12 in an official ceremony on the parade grounds at Lackland Air Force Base. Even though we reunited with him just the day before, I found myself way more emotional during the graduation ceremony than I expected to be. There was a different mood and energy that morning, and the vibe lasted the entire day. It wasn’t as anxious and frenetic as the day before, when Miss C and I were practically humming with anticipation just to see Martin. Instead, the vibe that Friday was slower and more nostalgic. And I was a sucker for it. Miss C and I both got up just a little extra early that morning, and dressed in new dresses and shoes we purchased for the occasion. Traffic was lighter, and we got to Lackland Air Force Base with plenty of time to spare. I was able to park just a short distance from the parade ground, which is the same parade ground my father marched on when he graduated from BMT in 1975, and the one I marched on in 2000. It’s lined by retired aircraft on display, and I pointed out different spots to Miss C, explaining the aircraft and showing her where my flight stood when I graduated from BMT, and how we marched. I kept catching myself asking her, “Don’t you remember that?”which was silly because obviously, she wasn’t even alive back then. But the memories of my time in BMT don’t seem all that long ago, definitely not more than a decade, not while I was standing there. Since I knew where Martin’s flight would be standing, Miss C and I found our seats again in the center of the front row of bleachers underneath one of the canopies to the right of the parade ground. We watched as family members began filling up the seats, and as the trainee on detail duty (similar to what Martin did a few weeks earlier) stood in front of us, politely asking guests not to step off the grass onto the walkway. As we waited, I wondered why I was feeling a lump in my throat about this whole thing. And then I got my answer. Shortly before the ceremony started, our friend Annette arrived and sat down next to us. As I mentioned in my previous post, Annette has known me for years. She retired from the Air Force in the 1990s, but continued working as a civilian writer/editor for the Air Force news agency in San Antonio. When I got stationed at the Pentagon, writing for the news service, she and I spent lots of time on the phone with conversations that started about something work-related, but eventually evolved to other awesomeness, such as learning that her parents were German immigrants, and she grew up in the Midwest, too. When I left active duty, she helped me craft my resume, told me to list her as a reference, and provided advice for my photography business. She’s a bonafide family friend. Of course, she came out to support Martin’s BMT graduation. 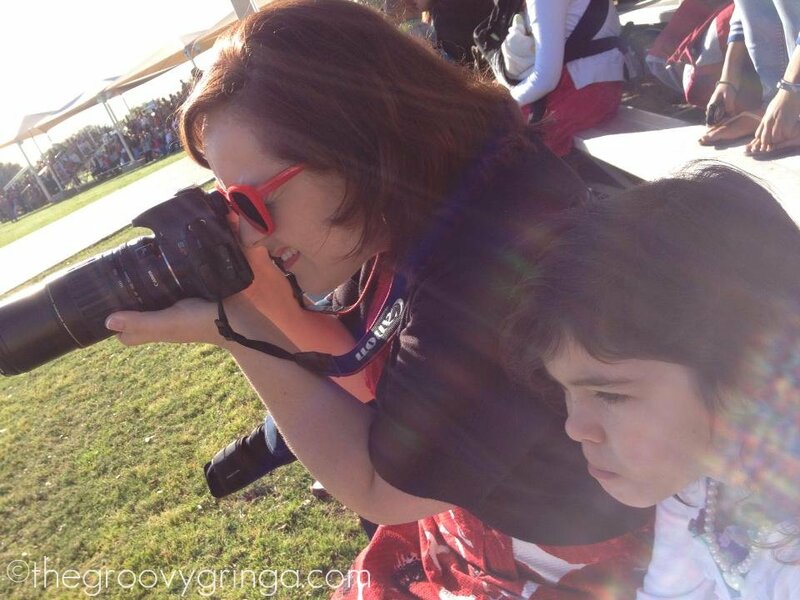 Annette took this photo of me taking a photo of Martin from across the field. Shortly after Annette arrived, two other dear friends showed up, too: Karen and April. April sidled up next to me as I had my camera raised, nudging me with her elbow. Out of the corner of my eye, I saw a flash of the ABU uniform and some rank, and wondered who on earth would violate my personal space like that. Of course, it would be April. 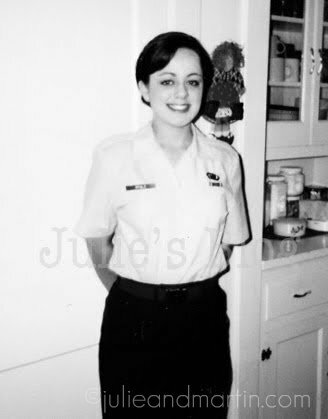 She and I were stationed together at the Pentagon before she got assigned to San Antonio. Although we worked in different offices, we always made time for lunch at the local Chevy’s Mexican restuarant. We trained and deployed at the same time. We were pregnant with our second babies at the same time, too, and her son was born just a few weeks after Lola. And a few years later, our families met up for lunch under the pretense of swapping some newborn baby clothes her boys no longer wore, and 24 hours later, I gave birth to Jaz. In my note of thanks to her, I blamed the Mexican food. And just like the day before at the Coin Ceremony, Karen appeared next to us on the bleachers, and the conversation picked up again just as easily. Just like the others, I’ve known Karen for years, having connected through career field workshops and forums. She took the reigns over the Air Force social media program when I left active duty, and we stayed connected as I worked in the Air Force Reserve, while also tracking our families and careers through social media. Three awesome friends, all a part of my own Air Force history. It felt great having them there. Karen, April, and me. I had left my coffee mug at the hotel. But then Steve showed up, too. Steve and I were stationed at Ramstein Air Base in Germany together more than 10 years ago. He was the one who picked me up at the airport when I arrived at my first duty station. He was also the one who introduced me to a hosting site that he and his bride Christina were using to share their then-recent wedding photos, a site that I ended up using just months later when my Bundeswehr boyfriend and I got engaged. More than 10 years later, he’s still active duty, and also now stationed in the San Antonio area with Christina and their children. It was so neat to see him again. This time, he was armed with cameras and a phone: equipment for his job doing social media for the Air Force. He pointed out another photographer, and explained his team was going to be tweeting about the ceremony, and posting things online. Every now and then, I looked online on my phone, and saw messages and posts from friends and family around the world — literally, from Asia to the Middle East to Europe to all over the United States — who were posting best wishes and sharing the link to the ceremony’s live-stream so others could watch it online. It was all so overwhelming. Meanwhile, across the field, Martin stood quietly with his flight, completely oblivious to the amazing support being shown to us at that very moment. It was really a very significant moment. I’ve been asked many times why on Earth I would support my husband’s decision to join the Air Force, especially at this stage in our lives. Especially since he would be starting from scratch, with no rank and in an unfamiliar career field. Especially with all the uncertainty in the world, and with an Air Force that’s trying to regain it’s footing after severe budget cuts, several horrifying sexual assault cases, questionable leadership decisions, force-shaping, and a host of other issues that paint such a bleak picture for the service. And especially since I was so burned out by all of it it when I left active duty. How could I be so accepting of Martin taking on the burden of service now, too, with all it’s risks and rewards? My answer to that was so obvious there at the ceremony. It’s because of the people like Annette, April, Karen, and Steve, and the many others who supported us that day. It’s because of Dan, who was stationed with us in Italy, who wrote to Martin during BMT from his new home in Minnesota. And Lupe, who was a fellow military spouse in Italy with Martin, who also wrote to him during BMT from Turkey, where her husband is now stationed. And Jason who sent me a screenshot of Martin’s flight from his computer in Germany. And Trevor who pulled from his past military training instructor experience to provide humor and insight to what Martin was going through, a British-American who helped us navigate the application and waiver process when Martin enlisted as a foreign national. And Sarah, the wife of a fellow public affairs NCO, who lives 10 minutes from my house and came over to fold laundry with me while Martin was gone. And Erin and Joe, who was my boss at Aviano, who checked in often from their home in Maryland, who offered to take the kids for a few hours whenever I needed a break. Coworkers don’t do that for each other … but friends do … and not just any friends, but friends who make up our Air Force family. It was through my Air Force career that we made all these connections, but Martin was embraced just the same. These are the people who were there for some of our best moments, and our worst. Who celebrated our accomplishments and milestones with us, and helped us see through the tough times. And though time and distance separates us from most of them now, those connections have stayed so strong. I never really felt like Martin was doing something new by joining the Air Force because he already was a part of it for so long. Yet at the ceremony, as I sat there surrounded — literally and virtually — by the family we created through my Air Force experience, I couldn’t help but feel so excited that Martin was officially becoming an Airman, and that he, too, would also be connecting and establishing relationships with truly amazing people … all in the process of doing something that is truly a calling for him. It made me feel so proud. And our Air Force family. The graduation ceremony itself only lasted about 30 minutes. Martin’s flight was honored as the “Honor Flight” which means out of all the graduating flights, his flight passed all the inspections, evaluations, and such with the most points. There was a speech given by Lt. Gen. Robert Allardice, who I actually interviewed a few times during my days at the Pentagon. Then the flights all marched in formation past the special guests and family members. I had the perfect view from my spot on the bleachers, but then other family members starting jumping up and standing in our way. Our friend April even jumped up to direct them all back to their seats, but when it became clear they weren’t going to respond, Miss C and I jumped up, too. We got right on the edge of the walkway, and once again, there was Martin right in front of us as his flight marched by. There’s Martin! This was a photo I took while my camera simultaneously recorded video. I love my camera. Once all the flights marched past us, they lined up again on the grass and were soon dismissed. Once again, family members were able to walk out to their Airmen, and it didn’t take long for us to get to Martin. And this time, we had an entourage: Karen, April, Annette, and Steve were all following Miss C and me as we approached Martin, who was able to keep a straight face the whole time. Not a single tear — just smiles all around. Well, all smiles for us, but not for the guy behind him. Ha! Photo by Steve G.
Martin’s flight regrouped after the ceremony for their Honor Flight portrait. This was the first good glimpse I got of Martin. We almost missed seeing Martin during the Airman’s Run that Thursday. It was a combination of the time change (San Antonio is one hour behind DC), me underestimating San Antonio’s rush-hour morning traffic, and me also having no idea what this Airman’s Run was really all about. Back in my day, there was nothing like an Airman’s Run at the end of Air Force Basic Military Training. My flight participated in a 5K at some point. I got a t-shirt. We ran two miles for our final fitness assessment. I did a good job with that. But an Airman’s Run? Where family members line the street and scream for their Airmen while holding up huge signs and taking photos while all the flights run around singing jodies and running in step? That’s something new. So I didn’t know what to expect or what exactly we were supposed to do, but in the end, it all worked out. Miss C and I arrived on base and parked a few blocks away from where the whole thing takes place. I thought I had at least 30 more minutes, and I had a general idea of where things would happen, so we started walking in that direction. At some point, though, we started to hear people screaming and chanting, and then I noticed other family members were running in a particular direction. So I grabbed Miss C’s hand, and together we started following the stragglers until we ended up at the end of a street. And it wasn’t just any street. It was the street where all the flights were running. But instead of ending up alongside the street, Miss C and I were actually at the very end of the street, facing the flights as they ran toward us before being forced to turn left. It ended up being the best place to stand, because if we were standing on the side of the street, there was a chance it would be the wrong side, or we would be lost in the crowds. But at this spot, there was no way Martin could avoid seeing us. There were only a handful of others standing next to us. We were looking at everyone. And everyone was looking at us. Including Martin, who was just one flight away from being right in front of us. to whip out my cell phone and set it on video. I didn’t get any photos. (Fortunately, I found a photo of Martin running on the BMT Facebook page.) Instead, I got incredibly shaky video as I held the phone in one hand and waved frantically with the other. Miss C was jumping up and down next to me. I made eye contact with Martin. I knew right away he saw us. And then he was gone again as the flight turned and ran away from us. Miss C and I were giggling the whole time. We half-heartedly ran across the way, hoping to catch another glimpse as the flights ran back from where they came, but that meant falling into the crowds lining the streets. There was no way we’d get a good view. We didn’t care, though. We definitely saw Martin. And we couldn’t wait to see him again. But we had to wait. We didn’t see him again for another few hours. In the meantime, Miss C and I huddled together on a set of metal bleachers lining a drill pad where the Airman’s Retreat and Coin Ceremony was to be held, shivering as the Texas temperatures dipped down into the 40s. At one point, a lady brought over a towel for Miss C to use as a blanket. The Coin and Retreat Ceremony is another new BMT experience. Back in my day, the Airman’s Coin was a relatively new collectible item for enlisted folk. It was explained to us that the coins were to be carried, and not dropped unless you wanted to buy everyone around you a beer. At least, that’s what I remembered. I was handed my coin by a chief master sergeant after my Warrior Week experience, standing alongside a metal warehouse with all my flight members. A Billy Ray Cyrus song blared over the sound system, and shortly after, a bus picked us up and drove us back to the dorms. There were no family members around. 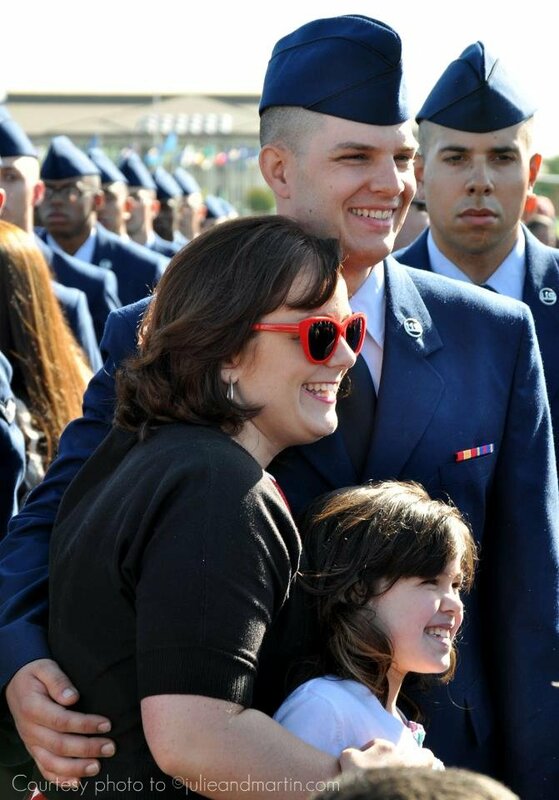 In fact, back in my day, the first time family members got to see their Airmen was right after the official graduation ceremony on Friday. But alas, when BMT got stretched out to eight and a half weeks, the time needed to be filled, and all these little traditions became more significant ceremonies. So that’s why Miss C and I sat on those freezing cold bleachers for a few hours, waiting for the Retreat and Coin Ceremony to start. To pass the time, we took pictures. I walked to the food stand and got breakfast for the two of us while Miss C saved our seats. I also chatted with some of the mothers I met online in our flight’s forum on the Air Force WingMom’s page. We all recognized each other from our posts. It seemed like forever before the flights started arriving. But sure enough, they started to appear shortly after the honor graduates were recognized. I knew Martin was an element leader in his flight, so I knew he would be marching in front of his group. We were seated in the center of the drill pad, though, and while I could make him out, I couldn’t really see him, so I switched to my zoom lens to get a better look. And I literally gasped when I saw him. It was like seeing Martin from years ago. Like, actually seeing my young German lieutenant standing over there, at attention, waiting to swing into step. That’s Martin, leading them into a turn. In his letters, Martin wrote about the times he marched past the groups of families waiting to see their graduating Airmen. At one point, he was working a detail and witnessed the many happy reunions. Watching those with young children really choked him up. He admitted he didn’t think he would be able to hold it together if he saw Miss C and me. He later said he was able to see Miss C and me right away since we snagged the best seats: front row and center in the bleachers right in front of his flight. He said he kept his attention on the top of the canopy above us, and refused to make eye contact with us. That didn’t stop me from taking a million photos, though. Truthfully, I didn’t pay any attention to the Retreat and Coin Ceremony. I know there were speeches to the history and significance of everything. All around me, mothers and girlfriends were sobbing and pointing out their loved ones. I even saw a few fathers dab at their eyes. But I just couldn’t be moved to tears. Instead, I was giddy with excitement, and I could feel Miss C growing anxious, too. We just wanted to get to Martin. We just wanted to grab onto him, to see him up close. 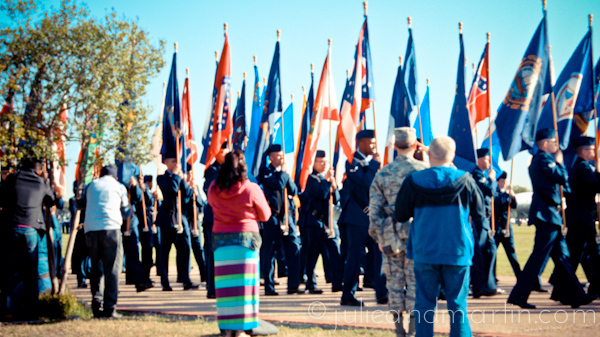 Once they officially ended the ceremony, families were able to step forward and walk to their Airmen. Just as I stood up, my friend Karen appeared out of nowhere. She is still active duty, working in public affairs and stationed in San Antonio, and decided to swing by the area, knowing we were there somewhere. Even though it’s been years since we saw each other, she just appeared and offered to take my camera to video the reunion. I just smiled and handed it to her. And the result was this video, which I posted last week. By the time we reached Martin, he was a mess. He was making what Miss C calls the “puffy face.” He admitted he lost all bearing when he saw us approach, and was in tears by the time we wrapped our arms around him. It was one of the best moments ever. We got to spend the rest of the day with Martin on “base liberty” which meant he was free to hang out with us, but he couldn’t leave Lackland Air Force Base. Then Larry, Martin, Miss C, and I went to the base bowling alley, where we played a few games. If it weren’t for the uniforms, and Martin’s new skinny face and lean body, and all the other Airmen and their families, it really would have felt like it was an ordinary family outing. But of course, it wasn’t. Still others approached him asking him for permission or confirmation of something, and I realized they were Airmen from his flight, seeing him as their element leader. I found it all very amusing. Miss C and I ended up staying on base until ten minutes before Martin was due back to his dorms. To be honest, we weren’t even bummed about saying goodbye. We knew the next day was going to be the official graduation ceremony, and then he would have a town pass to the leave the base. High-five with our friend Karen for remembering rank on right. We’re smiling here, but just moments before, we weren’t. Trust me. Miss C and I almost didn’t make it to Texas. Weeks in advance, I booked us a flight on Southwest Airlines from Baltimore to San Antonio to attend Martin’s graduation from Air Force Basic Military Training. The day of the flight, we arrived at the airport with plenty of time to find a good parking spot, get into the airport, check our baggage, make our way through security, and find some seats in the waiting area in front of our gate. Until our names were called to the desk. That’s where we learned that Southwest Airlines overbooks their flights. That means they sell up to 20% more seats than they have available because they expect a percentage of their customers to not show up. However, when all paying customers show up, some customers are left stranded. Miss C and I were left stranded. We were kicked off the flight. It’s a horrible business practice. The airline’s been slapped with fines about it in the past. I had no idea about it, until I was standing at the counter, trying to digest what the agent was telling me. She couldn’t get us to Texas that day. She could only put us on standby for the next couple flights … all which left the next morning. The earliest she could guarantee us a flight to Texas was Friday morning, putting us in San Antonio hours after Martin’s graduation ceremony. I was able to hold it together at the counter and try to get something worked out … until I turned around and saw Miss C, who heard and understood everything the agent was telling me. Big, fat tears rolled down her cheeks. “I’m not going to see Dad?” she wailed. Bless the businessman who saw what was happening and stepped forward. He gave up his seat so that Miss C could get a boarding pass. When I managed to catch my breath and explain why Miss C (and I) were so upset, he then went around the crowded waiting area, and tried to find another volunteer, saying he grew up in San Antonio and saw many military families reunite. Unfortunately, nobody else volunteered, but at least Miss C was able to get a boarding pass because of that gentleman. At least there was that. It was a tense 20 minutes as the attendant tried to find another way to get me on the flight. Meanwhile, I was on my cell phone with my friend Annette, who lives in San Antonio and was going to meet us at the airport. She immediately volunteered to meet and take Miss C if my daughter ended up traveling alone, and I knew my network of friends down there would ensure Miss C got to see her father. The agent did, though. She didn’t think we could get through the unaccompanied minor paperwork fast enough. So she made one more phone call to the crew on the plane, who said they had three empty seats that weren’t showing up on the computer up front. “You mean you have three empty seats?” the agent asked. When she got confirmation, she pointed at Miss C, me, and the one other lady who was also bumped to follow her. “You two ladies won’t have boarding passes, but I’m putting you on this flight,” she said. Once we go on board, we realized how the three seats became an issue. Three people bought extra seats. Those seats bumped Miss C, me, and the other lady off the flight. Miss C had the businessman’s boarding pass, but we still needed two seats for me and the other lady. Eventually, two of those passengers gave up their extra seats when the air crew promised vouchers for the money they had spent on them. Of course, none of these three seats were anywhere close to each other, but Miss C and I didn’t care. After I got her settled in the front of the plane, I made my way toward the back. But when others noticed she and I were being split up, a few agreed to swap seats, even though they knew it was going to be uncomfortable. Despite my great annoyance at the airline, I was humbled by the generosity of others. Because of them, Miss C and I were able to fly down to Texas that day sitting next to each other. So, as previously arranged, Annette greeted us at the San Antonio airport with a huge, colorful sign to welcome us to the great state of Texas after a three-hour flight that stretched to six hours due to the delayed boarding and massive storms that rolled across the midwest, resulting in a route change. Needless to say, we were happy to see her. She immediately took us to a local diner for some food, and it was absolutely wonderful to sit and catch up with her. We hadn’t seen each other in years — Lola was just a baby — but ours is one of those friendships that just roll right into being as if we’d only seen each other days ago. It was close to midnight by the time Miss C and I got to our hotel room. In my letters to Martin, I told him we were actually staying at a cheap roadside motel near the base that was way under budget. But actually, we were staying at a resort hotel that was slightly a splurge. I booked a king suite, and sure enough, there was a huge, comfortable bed waiting for us, along with slippers and robes and a platter of special cheeses, fruit, and crackers, along with sparkling water. Miss C and I were very impressed. But also exhausted and drained, and anxious for the next morning, when we would finally be able to see Martin for the first time in over two months. We went to bed almost immediately, relieved just to finally be in Texas. 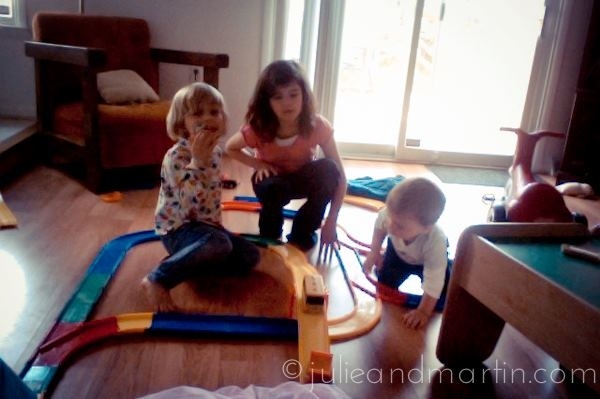 From today … I’m probably jinxing myself, but all three children are playing nicely together, building a racetrack in our family room. Yesssss! Martin is now graduated from Air Force Basic Military Training. After nearly nine weeks apart, Miss C and I reunited with him down at Lackland Air Force Base in San Antonio. We flew down there together on Wednesday, and the first time we got to see him was on Thursday during the Airman’s Run and Coin Ceremony. Here’s a montage of video and photos from the events. I will be sharing more from our weekend all this week. Photo from my sister Jill of Oma signing the papers, my Dad acting as photographer, and me smiling about something. I officially married Martin on a Friday after the Easter weekend in 2002. Eleven years later, the anniversary of our civil ceremony falls on a Friday after the Easter weekend. And just as he was back then, Martin is in the military again. I wonder what he is doing today on our anniversary, down there at Air Force basic training. I can say with confidence that whatever it is they have him doing is just about the farthest thing the both of us imagined for him that day in Germany eleven years ago. Once again, for Flashback Friday, you can read all about the civil ceremony HERE. And because the church wedding was pretty fun, too, click HERE. Martin and me cracking up as our photo was taken in 2010. It was the first time we heard from him in almost two weeks. Every time he’s called in the past, he always seemed a little disoriented about the dates. To him, the weeks have flown by; he’s been so busy. And with little access to the outside world and absolutely no access to the Internet, it’s been easy for him to lose track of the seasons and current events, and it wouldn’t have surprised me if he didn’t immediately recall that our wedding anniversary is later this week, but he did. He remembered, and wished me a happy anniversary right away. This is the first time in our marriage that we are apart on our anniversary. Last year, we renewed our vows in a small ceremony with our family and friends in Cincinnati. At the time, we were feeling pretty settled and in a good place — in our 30s with three kids and a nice house and steady income, living the dream — and we wanted to celebrate the milestone of keeping it together for a whole decade. At that moment one year ago, Martin joining the military again was not on our radar. But there we were then, and here we are now. Communicating through sporadic letters and phone calls. Disconnected as we individually deal with stressful situations. Despite all that, though, I feel like we’re experiencing a different type of renewal this year. And it’s not a benchmark, but a beginning. So I’m not disappointed at all with our circumstances this anniversary. Because even on the days when I’m overwhelmed and feel like an unbearable clamp is on my heart from the frustration and loneliness, I feel so confident that we’re right where we’re supposed to be. I packed up Amelia the Minivan and ventured off to Cincinnati over the weekend with the children and Patches Der Hund, to celebrate Easter again with our family in Ohio. 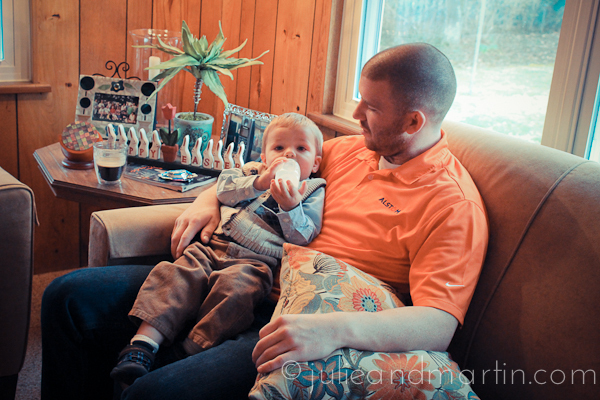 On Sunday morning, we headed over to Grandma MJ’s house, where we feasted on a traditional lunch with our family. My sister Jill and brother-in-law were there with my niece, the fabulous Miss J, who is just six months younger than Jaz. I’m convinced our kids are actually twins masquerading as cousins. Out of the four parents, none of us have blond hair nor do we have blue eyes, yet here we have blond-hair, blue-eyed children with wide smiles and cherub cheeks. 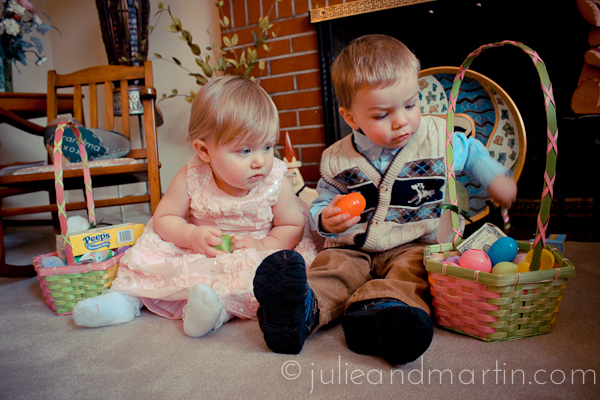 Weren’t they adorable in their Easter outfits? 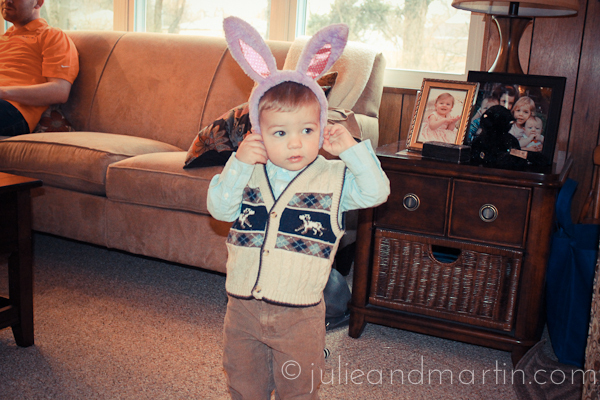 Jaz in a sweater vest just kills me. 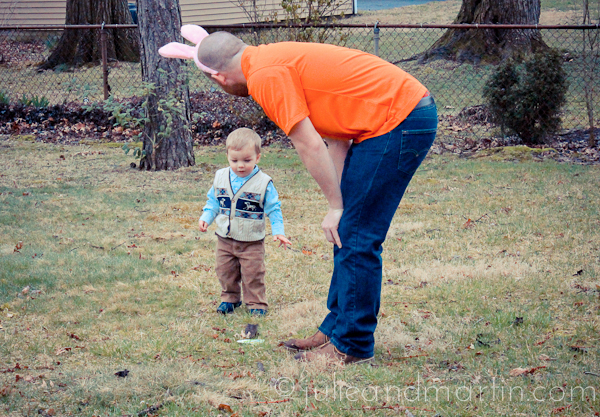 Anyway, the kids all participated in an Easter egg hunt in Grandma MJ’s backyard. 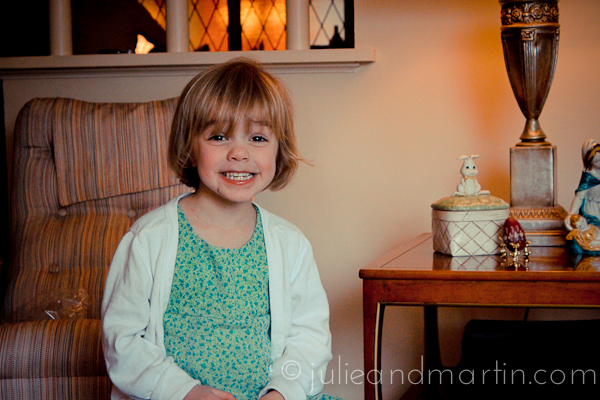 Miss C and Lola did very well, and the younger two got a second chance for success with a smaller egg hunt in the living room. 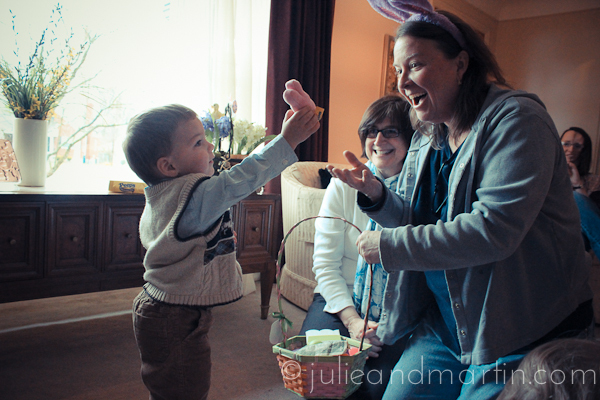 All the kids ended up with baskets full of goodies. But of course, I didn’t. Instead, I passed around some stationery for everyone to sign, and they did. I also took a lot of photos and video of the kids running around and laughing. At least he’ll be able to share in the memories when he gets home. 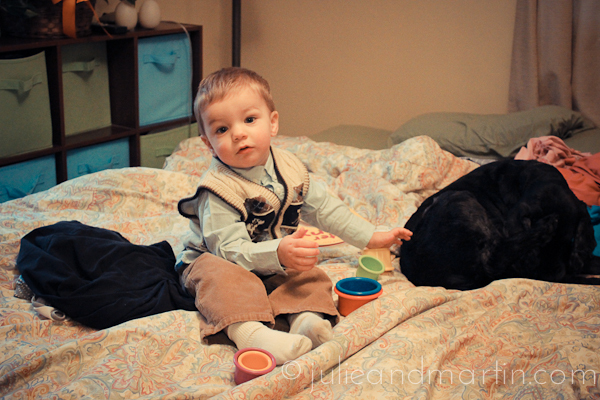 Jaz looking dapper while hanging out with Max the Dog. 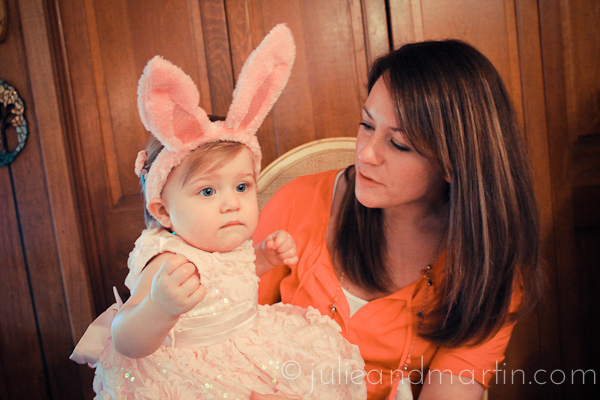 My sister Jill with my niece Miss J, who can’t decide if she loves the bunny ears. I have no idea what they are reacting to, but it cracks me up. Miss J and I mugging for the camera. Our cousin Rob was such a good helper! The kids just adore him. I have photos of Rob with each of my children like this. He’s just so cool! 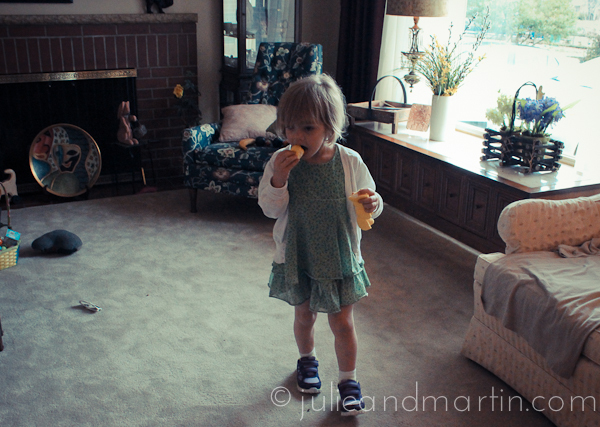 A girl can never eat too many Peeps. In my blues during a visit to Cincinnati after tech school in summer 2000. Martin began Week Seven today. I can’t tell you from personal experience what this particular week is all about because I didn’t have a Week Seven. A few days after my basic training graduation after six weeks, I was on a bus to the San Antonio airport for my flight to Baltimore. My technical school — which I will write more about later — was at Ft. Meade, an Army installation in Maryland between Baltimore and Washington DC. He’s still at Lackland Air Force Base in Texas. He’s almost done, but not quite. He’s done with BEAST week. Now, he’ll wrap up his training with a bunch of evaluations and classroom instruction. According to the various sources of information online, Martin will be learning about Airmanship (which I think has really been ongoing this whole time), as well as some skills he’ll need as a new Airman. I’m going to be very disappointed if I hear he didn’t stand up in that class and give those young men some solid financial advice. Seriously — the reason they have that class is because a lot of young people have never written a check … or opened a checking account … or handled anything other than cash. His flight will also be taking their final Air Force BMT fitness test, too. Needless to say, I think this is going to be an easy week for him.